Background Managing prescription renewal requests is a labor-intensive challenge in ambulatory care. In 2009, Vanderbilt University Medical Center developed clinic-specific standing prescription renewal orders that allowed nurses, under specific conditions, to authorize renewal requests. Formulary and authorization changes made maintaining these documents very challenging. Objective This article aims to review, standardize, and restructure legacy standing prescription renewal orders into a modular, scalable, and easier to manage format for conversion and use in a new electronic health record (EHR). Methods We created an enterprise-wide renewal domain model using modular subgroups within the main institutional standing renewal order policy by extracting metadata, medication group names, medication ingredient names, and renewal criteria from approved legacy standing renewal orders. Instance-based matching compared medication groups in a pairwise manner to calculate a similarity score between medication groups. We grouped and standardized medication groups with high similarity by mapping them to medication classes from a medication terminology vendor and filtering them by intended route (e.g., oral, subcutaneous, inhalation). After standardizing the renewal criteria to a short list of reusable criteria, the Pharmacy and Therapeutics (P&T) committee reviewed and approved candidate medication groups and corresponding renewal criteria. Results Seventy-eight legacy standing prescription renewal orders covered 135 clinics (some applied to multiple clinics). Several standing orders were perfectly congruent, listing identical medications for renewal. We consolidated 870 distinct medication classes to 164 subgroups and assigned renewal criteria. We consolidated 379 distinct legacy renewal criteria to 21 criteria. After approval by the P&T committee, we built subgroups in a structured and consistent format in the new EHR, where they facilitated chart review and standing order adherence by nurses. Additionally, clinicians could search an autogenerated document of the standing order content from the EHR data warehouse. 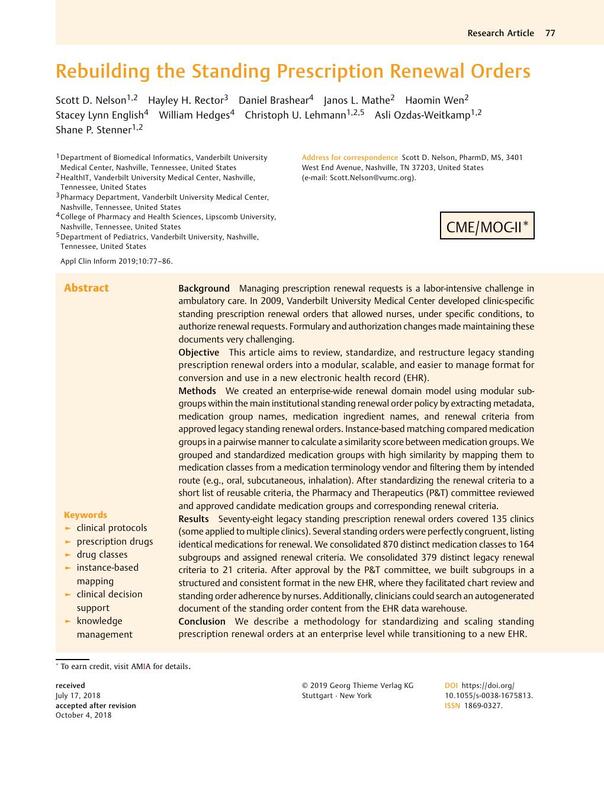 Conclusion We describe a methodology for standardizing and scaling standing prescription renewal orders at an enterprise level while transitioning to a new EHR. This study was performed in compliance with the World Medical Association Declaration of Helsinki on Ethical Principles for Medical Research Involving Human Subjects, and was reviewed by the VUMC's Institutional Review Board.